I’m not much of an art person when it comes to comics–I tend to prefer story over art…but that’s not to say that art doesn’t play a huge factor! And through the years, there have been a number of Superman comics whose covers have particularly stood out to me, for one reason or another. In this series, I presented 10 of my favorites and why they are favorites. Click the covers below to go to the original posts. I posted this series for 10 days from Wednesday, June 5 through Friday, June 14–opening day of Man of Steel. Click any of the covers above to see the full post for that issue. I’m not much of an art person when it comes to comics–I tend to prefer story over art…but that’s not to say that art doesn’t play a huge factor! And through the years, there have been a number of Superman comics whose covers have particularly stood out to me, for one reason or another. In this series, I’m presenting 10 of my favorites and why they are favorites. 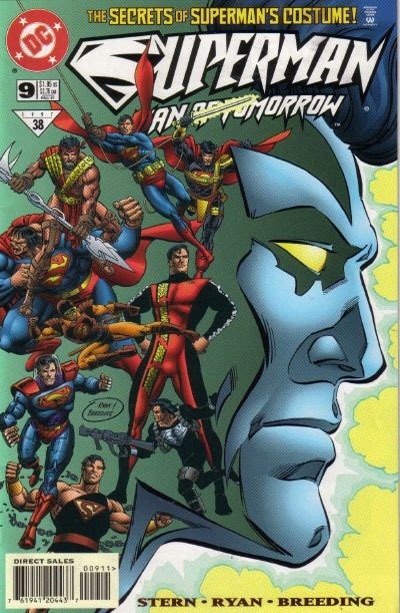 I wasn’t yet into comics for the premiere of the rebooted Superman #1, or the premiere issues of Adventures of Superman and Action Comics post-Crisis on Infinie Earths. And then Superman: The Man of Steel went and premiered during an off-year when I naively thought I was done with comics. I think the big appeal to me about this cover is seeing a bunch of the costumes in one go, from throughout this period of Superman to that point. Sort of a generic image, almost something worthy of a collected volume each spotlighting an issue with the different costumes. But the image alone really hits with the nostalgia factor, and so it stands out to me whenever I come across it–browsing cover images online, in bargain bins or browsing my own collection. I grabbed this issue out of a 25-cent bin last week. What grabbed me was the cover itself. This is from right in the middle of the whole “Electro-Supes” era from 1997 to 1998 when Superman was transformed into an energy-being with electrical powers and a new costume. The cover is billed as “The Secrets of Superman’s Costume!” and shows a bunch of the different costumes Superman’s had in the current continuity. 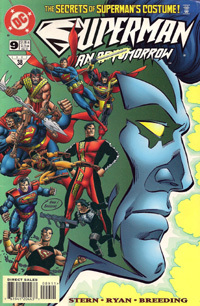 I couldn’t remember what the secret(s) of the electric costume were, and liked the cluster of variant costumes, and for only $.25 decided to buy this to re-read (having bought a copy originally the week it came out, at full cover price–but that copy’s buried away in one of my longboxes with the rest of my Superman comics from this era). Re-reading it didn’t bring quite the experience I was looking for, but certainly was worth my 25-cents. 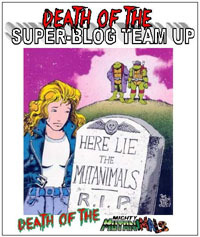 We open on Jonathan Kent falling asleep to some news about Superman, and dreaming an amalgamation of current events and stuff from the 1986 Man of Steel mini-series. He remembers the incident that brought Clark into the public eye as Superman, but replacing the development of the “classic costume” with the energy containment “electric costume.” When Martha wakes him, the two remenisce over the various events their son’s been through, essentially hitting on key points in the then-current continuity of Superman, as measured by the costume variants he’d been depicted in. By the end of the issue, Clark drops in, and we see the current costume in action. Overall, I really like the art in this issue. I’ve generally enjoyed Breeding‘s art, and while an occasional panel here and there might have an element that seems a bit “off,” it’s hard to know if that should be pinned on the pencils, inking, coloring, or what, within the process. The overall visuals of the issue are a real treat–it’s quite enjoyable seeing all these different costumes Superman’s had, even if most of them lasted for only a few weeks or a single story and weren’t necessarily an “official” costume change the way the electric suit was. Story-wise, I’m really not all that impressed. This is definitely a throw-away issue in terms of ongoing continuity–it’s relatively “timeless” and seems to have nothing to do with anything immediately before nor does it lead into something else. It’s a one-shot, and fairly contrived: Jonathan dreaming and then he and Martha having a conversation with these sorts of details recapping all these events just doesn’t seem at all realistic. 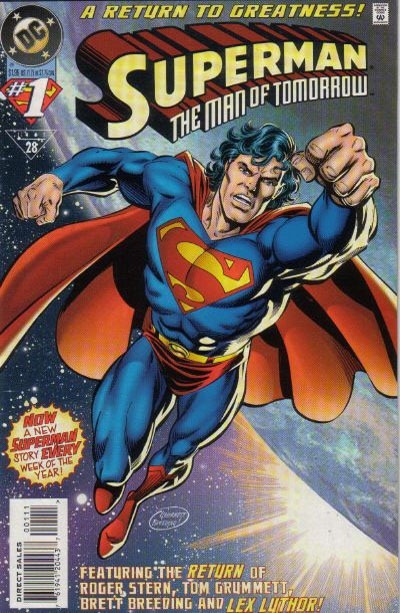 Despite that, this issue deals very much with long-term continuity by touching on all these events, Stern showing an obvious knowledge of the events, having been part of a lot of them (particularly the Death/Return of Superman). In contemporary terms, this would be a great 0-issue or Point-One issue. And while this does not continue a particular story from the previous week nor lead into the next week–that makes it a nice stand-alone one-shot. I remember this era so have vague recollection for context, and it’s nice to take a peek back without getting sucked into wanting to immediately re-read anything else from this time.